Placed in high traffic areas, the standing signboards are an excellent and affordable way to promote your company’s product or service. The standing sign measures 3’ wide by 8’ high. 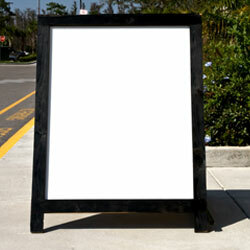 They are double sided and free standing thus giving you double the visibility.